Darwin's God: Is Evolution an Enabler of All Kinds of Absurdities? Is Evolution an Enabler of All Kinds of Absurdities? That's the sound of a professional Creationism lobbyist hitting rock bottom. 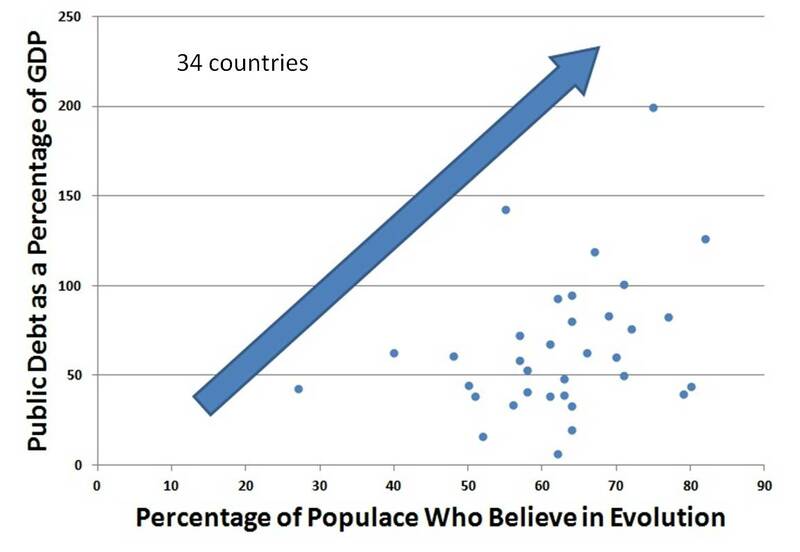 Belief in Religious Creationism vs. Education Level. Amazing how well belief in creationism correlates with ignorance. Not amazing at all actually. I've done a linear regression on the data. First of all, the best fitting straight line has a slope of 0.77 rather than the roughly 5 of your arrow. Misleading by a factor of 6. Second, the slope is not significantly different from 0 (p=0.16). There is no evidence for a relationship between the two quantities. Just remember - it's not lying if you're doing it for Jesus! I'd love to know the source for the data on that chart, especially since CH neglected to label any of the data points or give any references. Looks like he combined two separate data sets - one a chart of average household income vs. debt as percentage of GDP, the other a chart of average household income vs. acceptance of evolution. CH is really scraping the bottom with this trash. Thorton, the data are all over the internet. I took the debt-as-%GDP data from here (using the IMF column) and the belief-in-evolution data from here. Almost identical data set, but notice the best fit curve looks nothing like CH's bogus arrow. Also, notice the one outlier in the data. Sad. 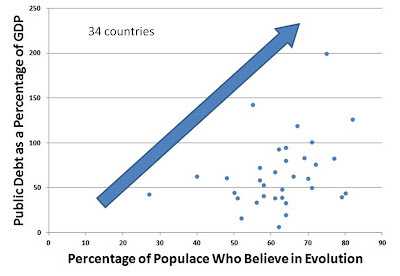 I wonder why Cornelius pretended there is a connection between public debt and believe in evolution. Maybe he didn't do the analysis and really believed there is a significant correlation. In which case he is sloppy. Or he did know there is no significant correlation, in which case he is lying. So which is it, Cornelius? And what were you trying to prove? Prediction: shortly there will be several new posts in order to distract from this embarrassing blunder. Is this news? I think not. If you are a creationists you follow the moral teachings of the Bible. If you follow the Bible then the family relies on a father who provides. If you do not follow the Bible then large numbers of families do not have fathers. Parents don't provide, the state does. The state can't afford to provide for every fatherless family so it runs a deficit. Boring. More interesting is that the families of societies that believe in evolution do not have enough children to replaces themselves. They are dying - U.S. and all of Europe. God is life and evolutionists are the walking dead. Peter, have you considered psychiatric help? Your name is quite the misnomer. To be truthful you should call yourself "The whole delusion", because you've swallowed evolutionary lies hook, line and sinker.